The 92-year-old Kissinger has a long history of involvement in Iran, and his recent opposition to Barack Obama’s Iran nuclear deal, while relatively subdued by present Washington standards, matters. In it lies a certain irony, given his own largely unexamined record in the region. Kissinger’s criticism has focused mostly on warning that the deal might provoke a regional nuclear arms race as Sunni states led by Saudi Arabia line up against Shia Iran. “We will live in a proliferated world,” he said in testimony before the Senate. In a Wall Street Journal op-ed co-authored with another former secretary of state, George Shultz, Kissinger worried that, as the region “trends toward sectarian upheaval” and “state collapse,” the “disequilibrium of power” might likely tilt toward Tehran. 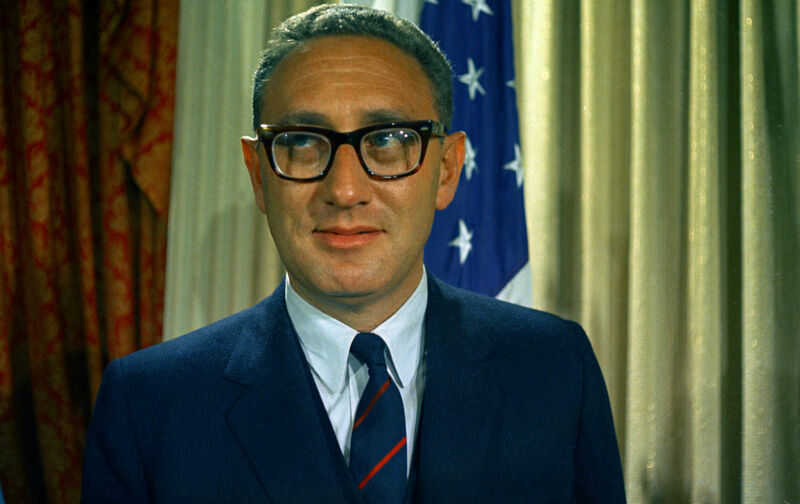 Of all people, Kissinger knows well how easily the best-laid plans can go astray and careen toward disaster. The former diplomat is by no means solely responsible for the mess that is today’s Middle East. There is, of course, George W. Bush’s 2003 invasion of Iraq (which Kissinger supported). But he does bear far more responsibility for our proliferated world’s disequilibrium of power than anyone usually recognizes. Some of his Middle East policies are well known. In early 1974, for instance, his so-called shuttle diplomacy helped deescalate the tensions that had led to the previous year’s Arab-Israeli War. At the same time, however, it locked in Israel’s veto over US foreign policy for decades to come. And in December 1975, wrongly believing that he had worked out a lasting pro-American balance of power between Iran and Iraq, Kissinger withdrew his previous support from the Kurds (whom he had been using as agents of destabilization against Baghdad’s Baathists). Iraq moved quickly to launch an assault on the Kurds that killed thousands and then implemented a program of ethnic cleansing, forcibly relocating Kurdish survivors and moving Arabs into their homes. “Even in the context of covert action ours was a cynical enterprise,” noted a congressional investigation into his sacrifice of the Kurds. What the shah wanted most of all were weapons of every variety—and American military trainers, and a navy, and an air force. It was Kissinger who overrode State Department and Pentagon objections and gave the shah what no other country had: the ability to buy anything he wanted from US weapons makers. By 1976, Kissinger’s last full year in office, Iran had become the largest purchaser of American weaponry and housed the largest contingent of US military advisers anywhere on the planet. By 1977, the historian Ervand Abrahamian notes, “the shah had the largest navy in the Persian Gulf, the largest air force in Western Asia, and the fifth-largest army in the whole world.” That meant, just to begin a list, thousands of modern tanks, hundreds of helicopters, F-4 and F-5 fighter jets, dozens of hovercraft, long-range artillery pieces, and Maverick missiles. The next year, the shah bought another $12 billion worth of equipment. After the shah fell, the ayatollahs were the beneficiaries of Kissinger’s arms largesse, inheriting billions of dollars of warships, tanks, fighter jets, guns, and other materiel. It was also Kissinger who successfully urged the Carter administration to grant the shah asylum in the United States, which hastened the deterioration of relations between Tehran and Washington, precipitating the embassy hostage crisis. Then, in 1980, Saddam Hussein’s Iraq invaded Iran, beginning a war that consumed hundreds of thousands of lives. The administration of Ronald Reagan “tilted” toward Baghdad, providing battlefield intelligence used to launch lethal sarin gas attacks on Iranian troops. At the same time, the White House illegally and infamously trafficked high-tech weaponry to revolutionary Iran as part of what became the Iran/Contra affair. Kissinger’s other “guardian” of the Gulf, Sunni Saudi Arabia, however, didn’t fall, and he did everything he could to turn that already close relationship into an ironclad alliance. In 1975, he signaled what was to come by working out an arms deal for the Saudi regime similar to the one he had green-lighted for Tehran, including a $750 million contract for the sale of 60 F-5E/F fighters to the sheiks. By this time, the United States already had more than a trillion dollars’ worth of military agreements with Riyadh. Only Iran had more. By June 1974, Treasury Secretary George Shultz was already suggesting that rising oil prices could result in a “highly advantageous mutual bargain” between the United States and petroleum-producing countries in the Middle East. Such a “bargain,” as others then began to argue, might solve a number of problems, creating demand for the US dollar, injecting needed money into a flagging defense industry hard hit by the Vietnam wind-down, and using petrodollars to cover mounting trade deficits. As it happened, petrodollars would prove anything but a quick fix. High energy prices were a drag on the US economy, with inflation and high interest rates remaining a problem for nearly a decade. Nor was petrodollar dependence part of any preconceived Kissingerian “plan.” As with far more of his moves than he or his admirers now care to admit, he more or less stumbled into it. This was why, in periodic frustration, he occasionally daydreamed about simply seizing the oil fields of the Arabian peninsula and doing away with all the developing economic troubles. Such scimitar rattling was, however, pure posturing. Not only did Kissinger broker the various deals that got the United States hooked on recycled Saudi petrodollars, he also began to promote the idea of an “oil-floor price” below which the cost per barrel wouldn’t fall. Among other things, this scheme was meant to protect the Saudis (and Iran, until 1979) from a sudden drop in demand and provide US petroleum corporations with guaranteed profit margins. Since the 1970s, one administration after another has found the iron-clad alliance Kissinger deepened between the House of Saud’s medieval “moderates” and Washington indispensable not only to keep the oil flowing but as a balance against Shia radicalism and secular nationalism of every sort. Recently, however, a series of world-historical events has shattered the context in which that alliance seemed to make sense. These include: the catastrophic war on and occupation of Iraq, the Arab Spring, the Syrian uprising and ensuing civil war, the rise of ISIS, Israel’s right-wing lurch, the conflict in Yemen, the falling price of petroleum, and, now, Obama’s Iran deal. If fortune is really shining on Lockheed and Boeing, Kissinger’s prediction that Obama’s deescalation of tensions with Tehran will sooner or later prompt Saudi-Iranian hostilities will pan out. “With the balance of power in the Middle East in flux, several defense analysts said that could change. Russia is a major arms supplier to Iran, and a decision by President Vladimir Putin to sell an advanced air defense system to Iran could increase demand for the F-35, which is likely to have the ability to penetrate Russian-made defenses,” the Times reports. Tehran also began to meddle in Afghan politics, offering Kabul billions of dollars for development and security, in exchange for loosening “its ties with the Soviet Union.” This might have seemed a reasonably peaceful way to increase US influence via Iran over Kabul. It was, however, paired with an explosive initiative: via SAVAK, the shah’s secret police, and Pakistan’s Inter-Services Intelligence agency (ISI), extremist Islamic insurgents were to be slipped into Afghanistan to destabilize Kabul’s republican government. Kissinger helped make that possible, in part by the key role he played in building up Pakistan as part of a regional strategy in which Iran and Saudi Arabia were similarly deputized to do his dirty work. When Pakistani Prime Minister Zulfikar Ali Bhutto, who had backed the 1971 rampage in East Pakistan, visited Washington in 1975 to make the case for restoration of military aid, Kissinger assured President Gerald Ford that he “was great in ’71.” Ford agreed, and US dollars soon started to flow directly to the Pakistani army and intelligence service. Moscow’s occupation of Afghanistan would prove a disaster—and not just for the Soviet Union. When Soviet troops pulled out in 1989, they left behind a shattered country and a shadowy network of insurgent fundamentalists who, for years, had worked hand-in-glove with the CIA in the agency’s longest covert operation, as well as the Saudis and the Pakistani ISI. It was a distinctly Kissingerian line-up of forces. Few serious scholars now believe that the Soviet Union would have proved any more durable had it not invaded Afghanistan. Nor did the allegiance of Afghanistan—whether it tilted toward Washington, Moscow, or Tehran—make any difference to the outcome of the Cold War, any more than did, say, that of Cuba, Iraq, Angola, or Vietnam. Similarly, each of Kissinger’s Middle East initiatives has been disastrous in the long run. Just think about them from the vantage point of 2015: banking on despots, inflating the shah, providing massive amounts of aid to security forces that tortured and terrorized democrats, pumping up the US defense industry with recycled petrodollars and so spurring a Middle East arms race financed by high gas prices, emboldening Pakistan’s intelligence service, nurturing Islamic fundamentalism, playing Iran and the Kurds off against Iraq, and then Iraq and Iran off against the Kurds, and committing Washington to defending Israel’s occupation of Arab lands.